#15032 is a very comfortable continuous yoke-back chair with arms. 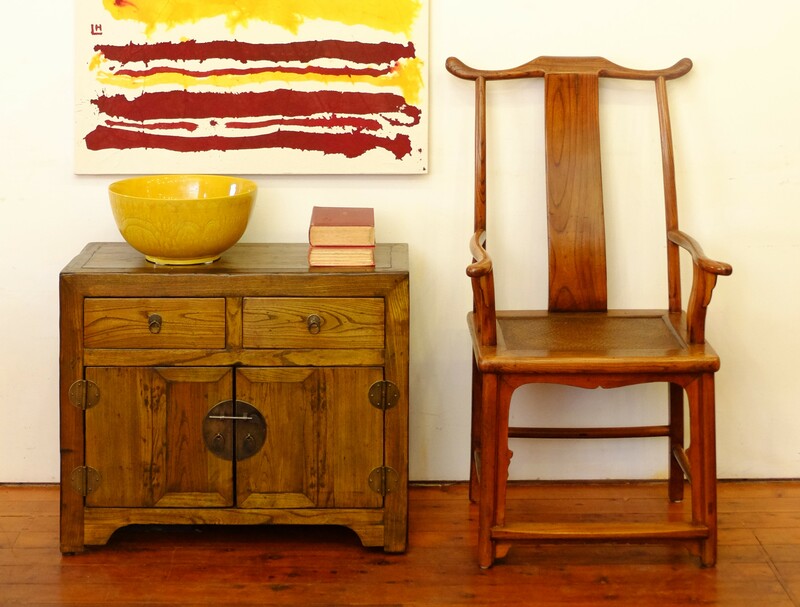 It dates from the 1940s and is made from northern elm. 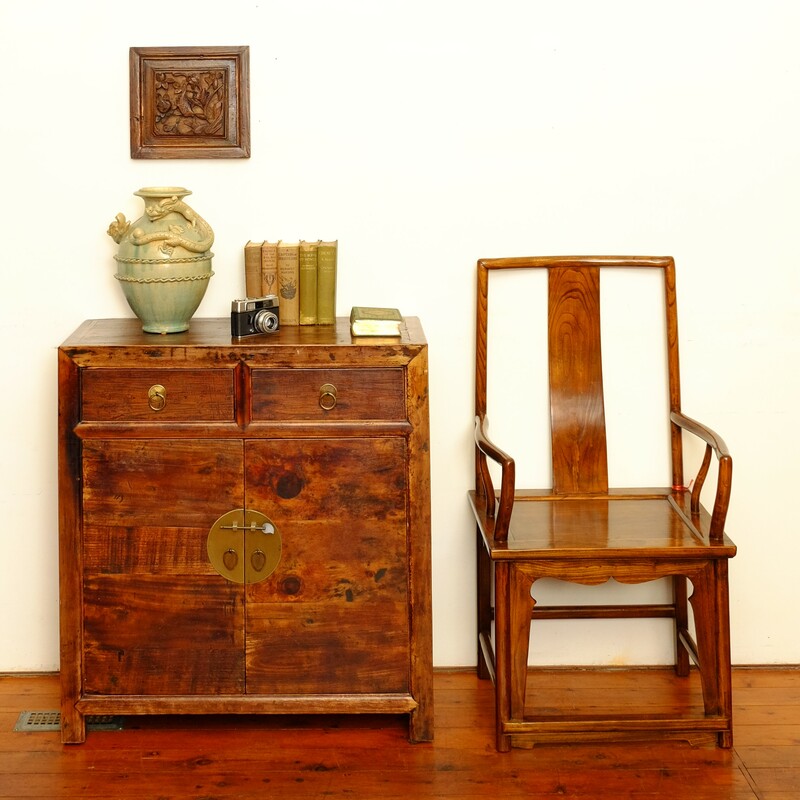 The chair seat is 56 cm wide X 45 cm deep and 46.5 cm from the floor. The chair back stands 106 cm at its highest point. 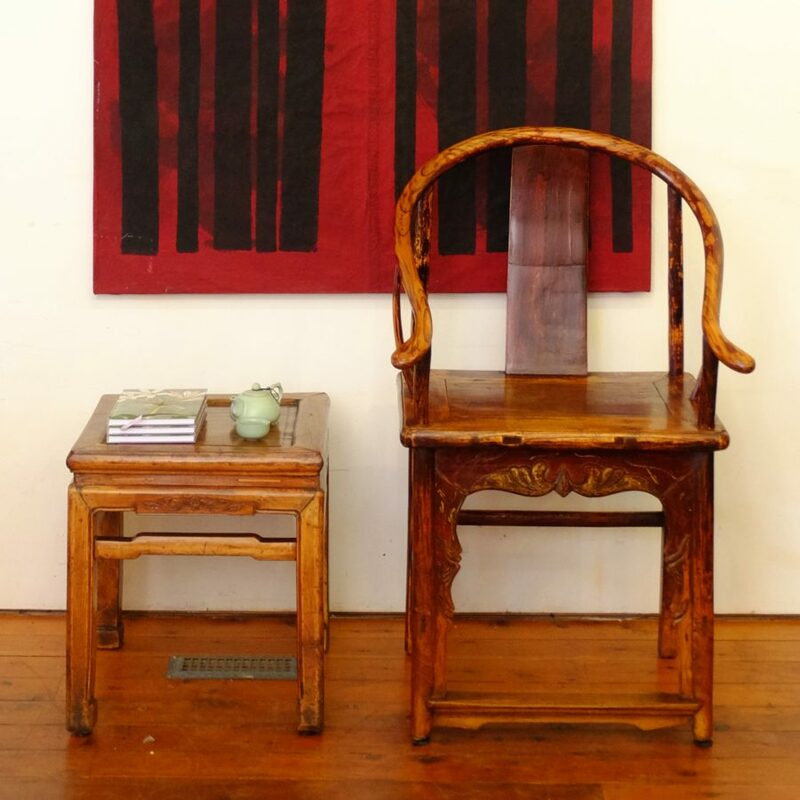 #15065 This small horshoe dining chair with arms was designed by Silk Road Gallery and hand made from recycled northern elm. 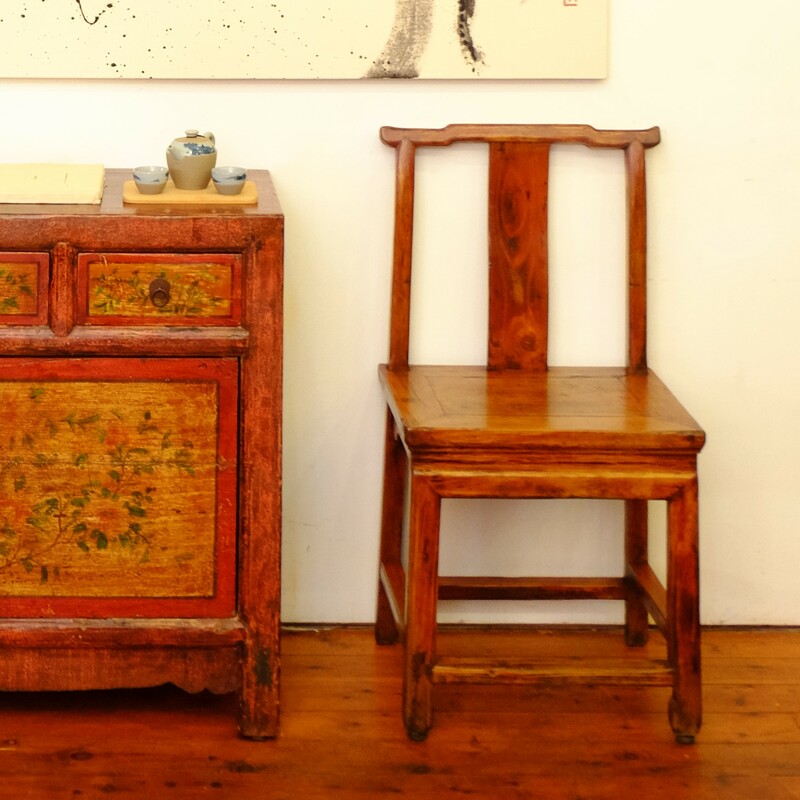 The chair seat measures 45 cm wide by 40 cm deep and 49 cm from the floor. The chair back stands 88 cm tall at its highest point. 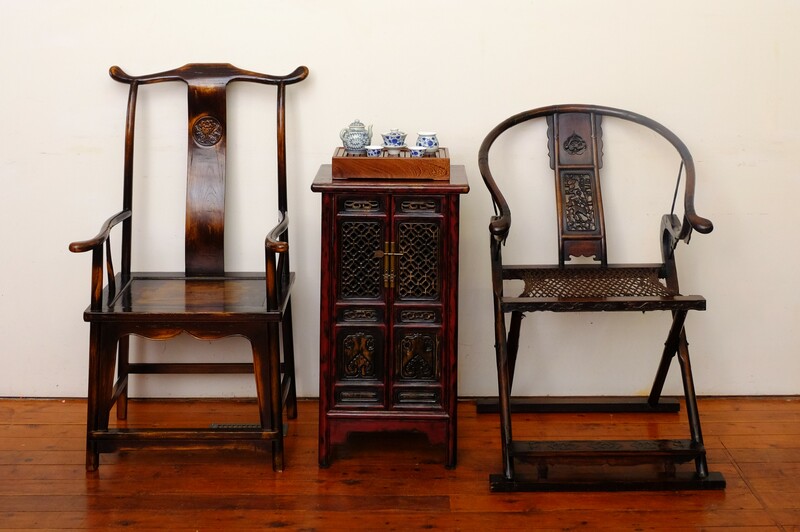 #16030 This horseshoe yoke back chair with arms is built in a classic Ming dynasty style. 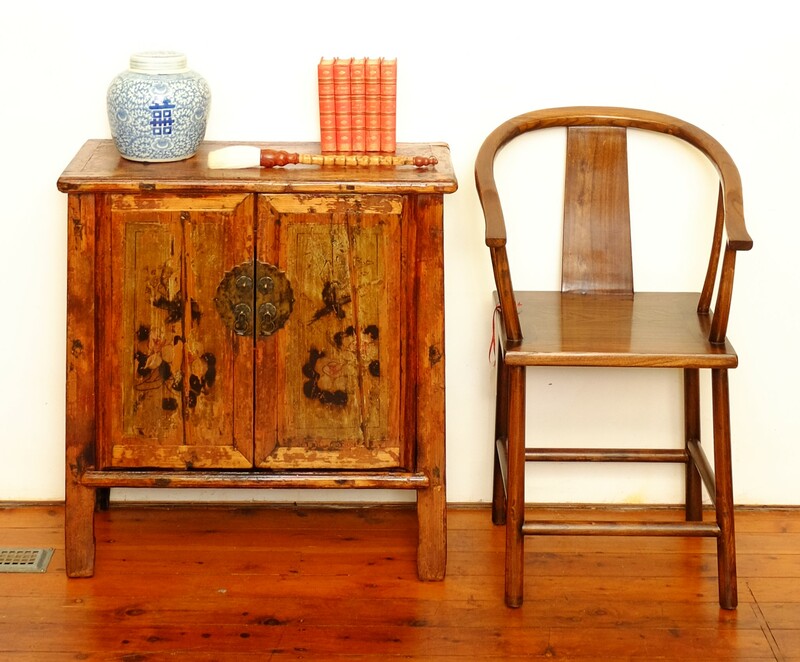 The rich reddish glow of the timber reflects traces of old lacquer. The seat measures 57 cm wide by 44 cm deep and is 55 cm from the floor. 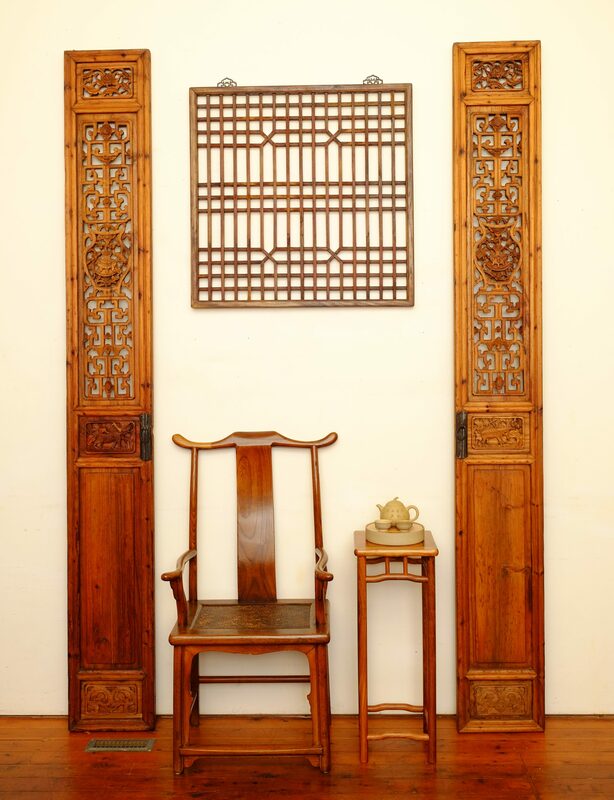 The chair back stands 102 cm tall at its highest point and the arms are 62 cm at their widest point. 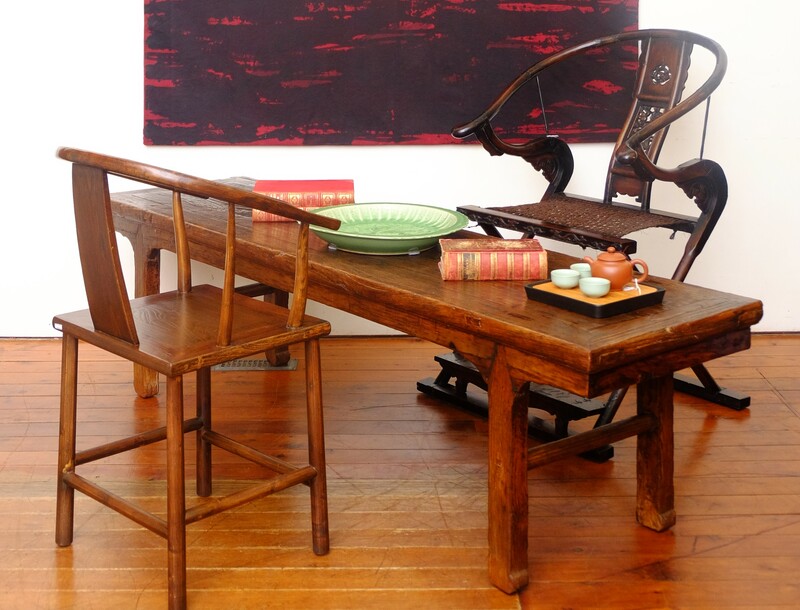 #16030 another view highlighting the warm almost honey tones of the old lacquer. #15065 on the left and #16030 on the right. #15033 A handsome carved chair with a continuous yoke-back and arms that dates from the1930s. 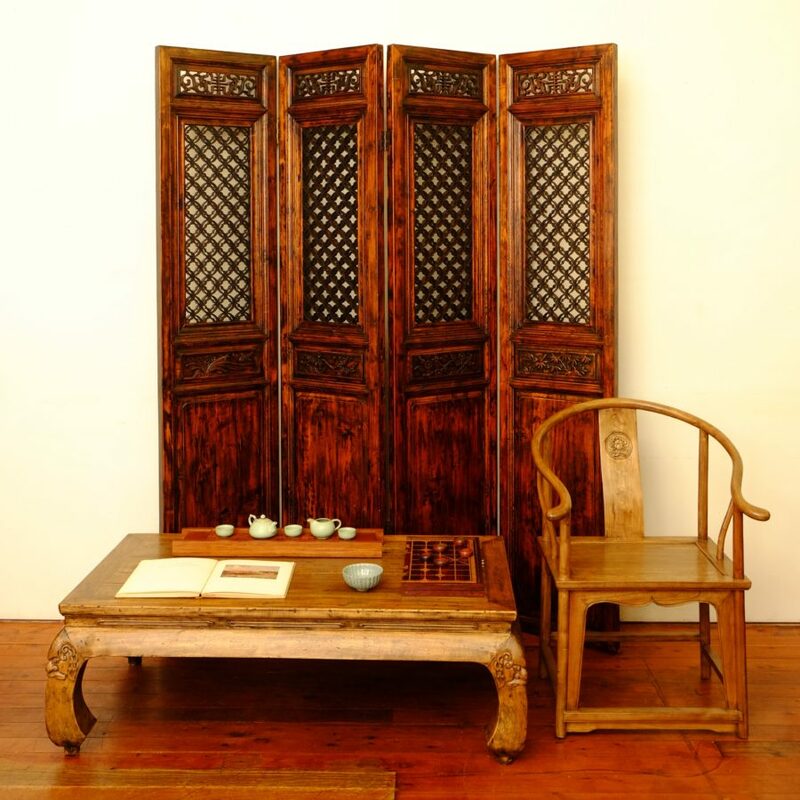 It is made of northern elm and was originally lacquered in black. Seat measurements are 60 cm wide by 46 cm deep and 49 cm from the floor. The back is 120 cm tall and 68 cm wide. #15033 (left) and #15032 ready for tea and a pleasant chat. #15036 This simple lady chair dates from the early 1900s. 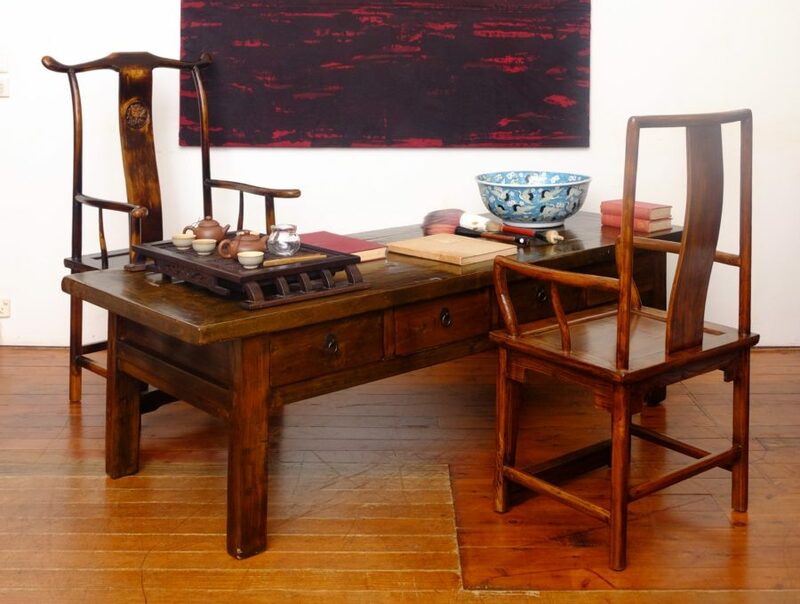 Made from northern elm, it comes from Fujian province. #16031 is a yoke-back chair with arms made in northern elm. 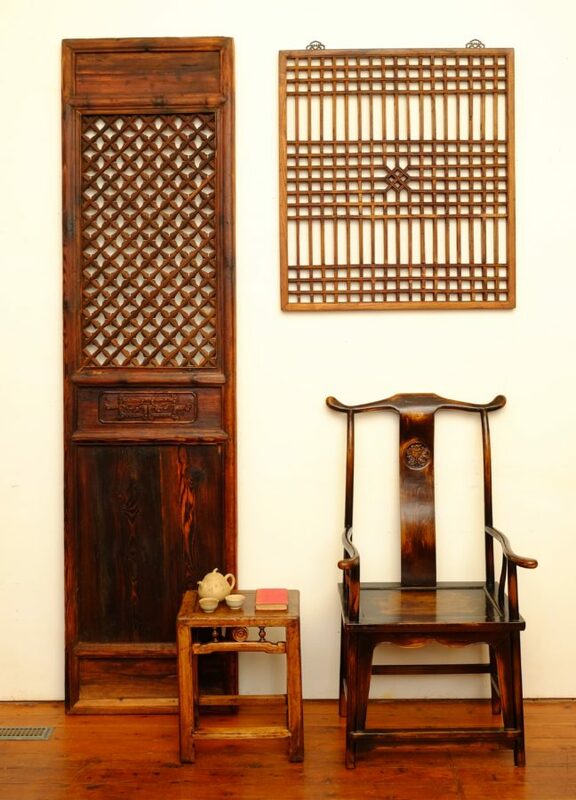 The seat is tightly and finely woven in rattan. 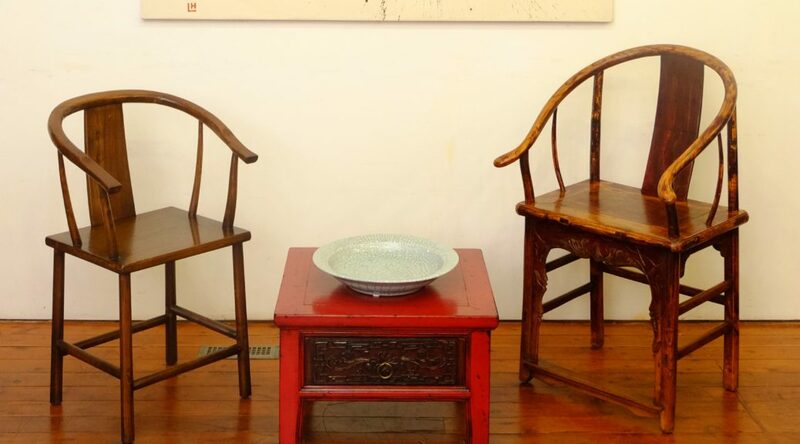 This chair seat is 59 cm wide by 56 cm deep and 51.5 cm from the floor. The back stands 118 cm tall and is 68 cm at its widest. 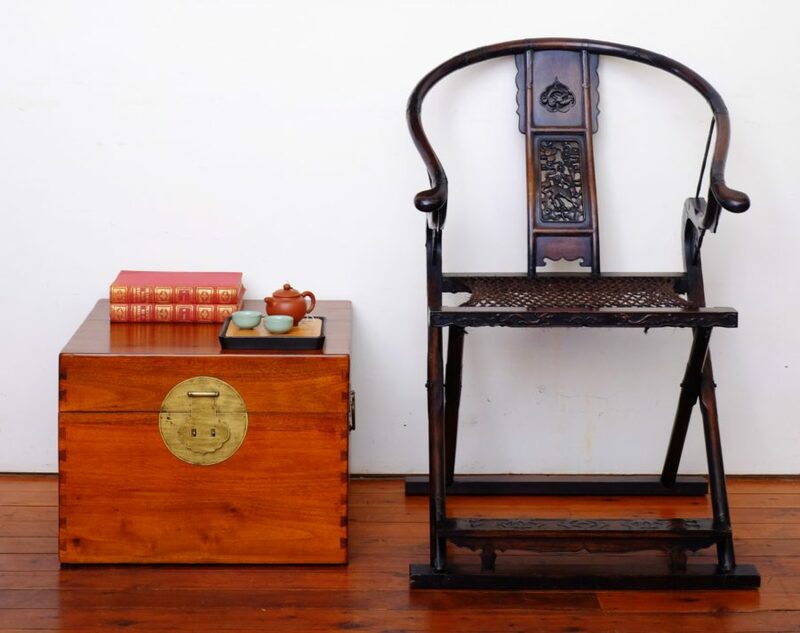 #17030 is an interesting Chinese magistrate’s folding chair fitted with pierced brass mounts, a woven rattan seat and intricate carving on the back splat.. 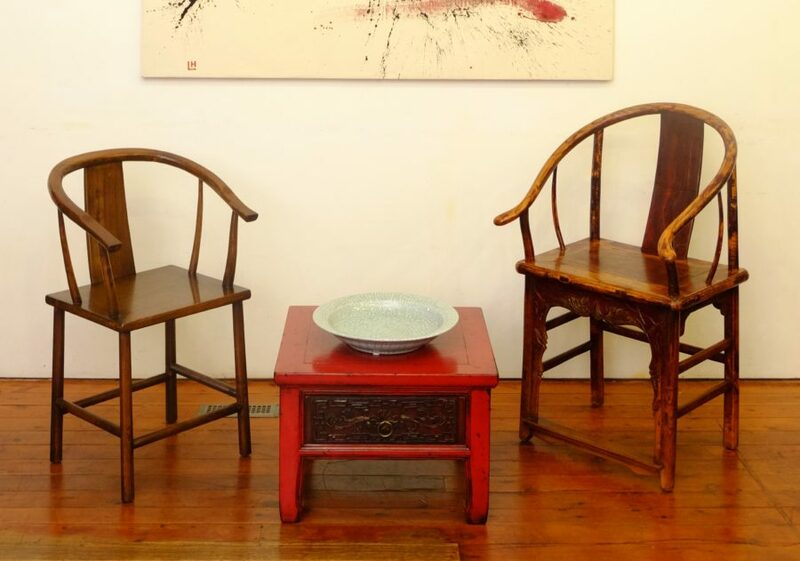 The chair footprint on the floor is 69 cm wide by 63 cm deep and it is 105 cm tall at its highest point. The seat is 62 cm wide by 63 cm deep and stands 53 cm from the floor. A rear view of #15065 seated opposite #16030. #15033 and #16030, perhaps waiting in the court house for the magistrate and some other important official? 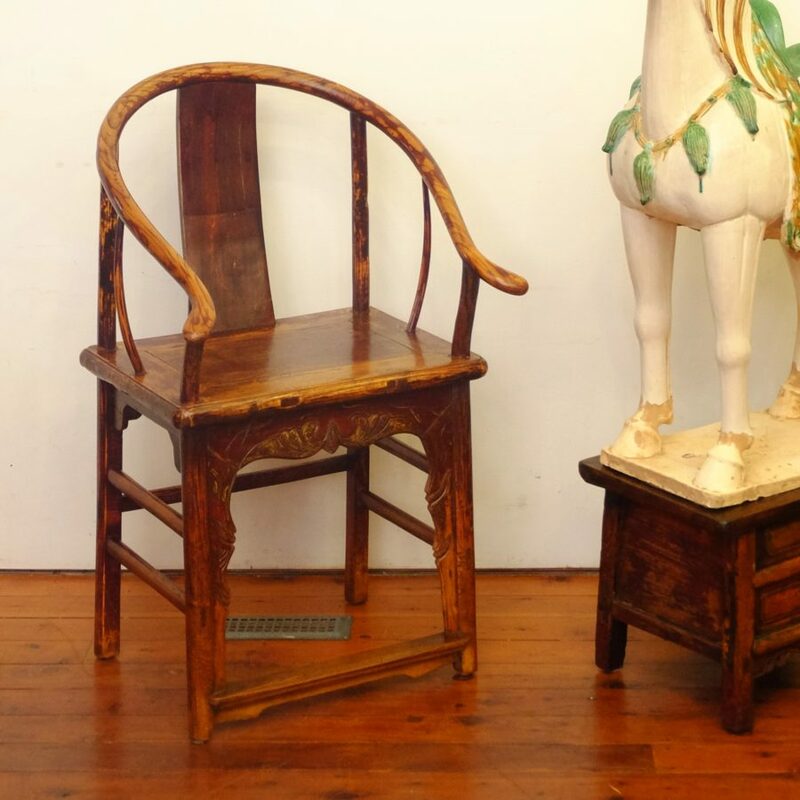 #15051 a horseshoe chair with arms, handmade from recycled northern elm. The seat measures 60 cm wide by 47 cm deep and 49 cm from the floor. The horseshoe back is 95 cm at its highest point and 68 cm at its widest.